Probably my favorite reason for listing my used gear on Reverb are the lowered fees. 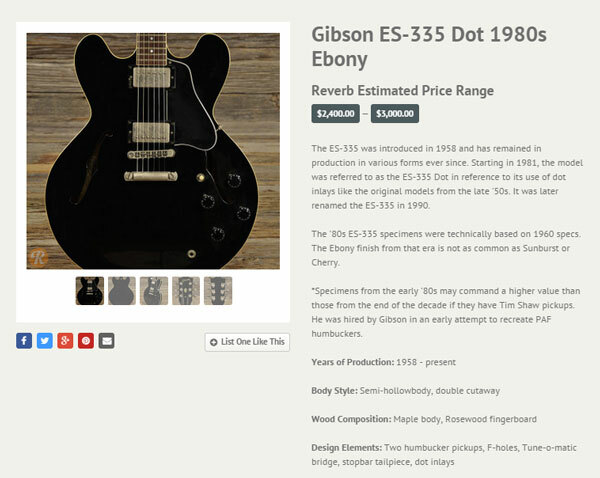 Reverb listing fees are 3.5% of the final value when an item is sold. Then add in 2.9% plus $0.30 for Paypal’s cut. But compared to Ebay, the online auction giant charges an astounding 10% of the final value when the item is sold. Plus the 2.9% and $0.30 from Paypal (an Ebay owned company). 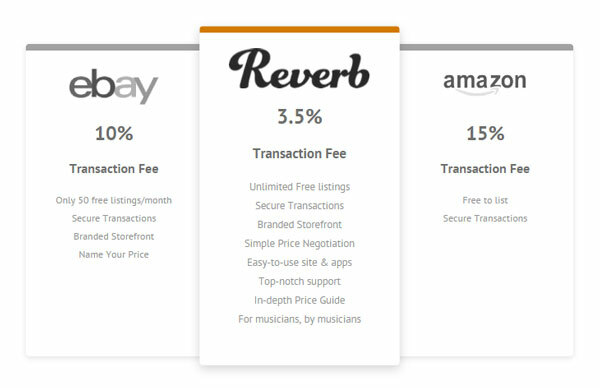 So in total (adding Paypal fees in) that’s roughly 6.5% from Reverb compared to almost 13% from Ebay. I’m quite terrible at math but even I can tell you that you’re getting a much better deal on Reverb. Reverb is geared specifically for Musicians. 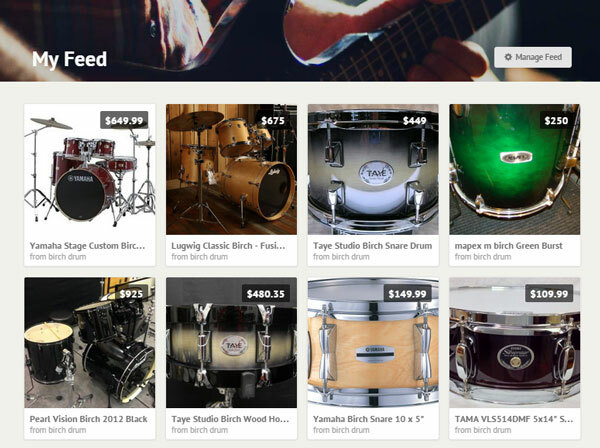 It is similar to Ebay yet it’s made specifically for the purpose of buying and selling music gear and equipment. 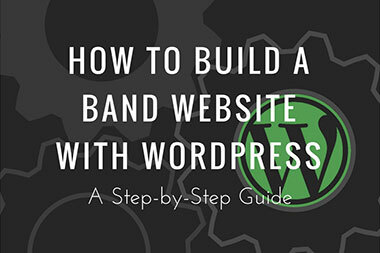 It has a ton of great resources for musicians such as their blog and pricing guide and it’s easy to search for the music gear you want. Known as “The Reverb Tank”, the blog for Reverb has a bunch of great resources and articles. 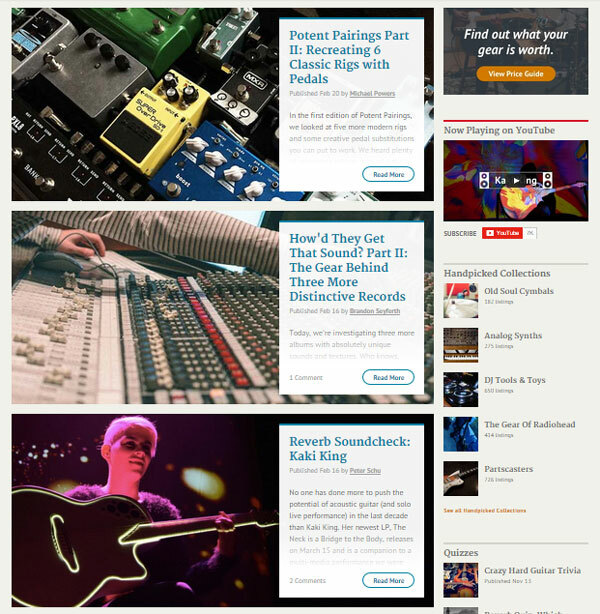 Meant to inspire and give helpful information, Reverb features articles like “Building a Better Board“, “5 Tips for Your First Professional Gig“, and “Beginners Guide to Guitar Effects: Understanding the Basics“. They have a lot of great posts like these that are really helpful and inspiring. 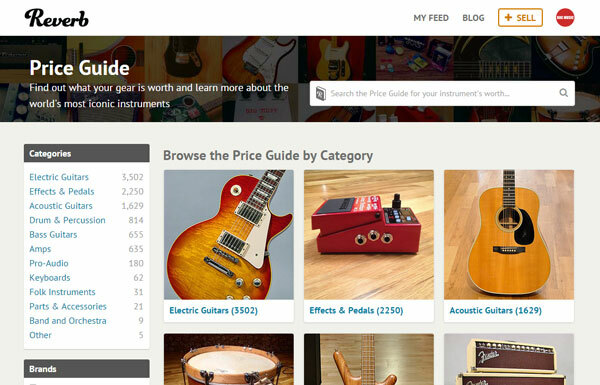 Reverb has a section that is dedicated to helping you find out the value of your gear. This is helpful when listing your gear on the site and you want to see what it’s going for to give you an idea of what to list your gear at. This information is gathered from Reverb by sorting through thousands of transactions and recently sold items to give an accurate and real-time price benchmark. 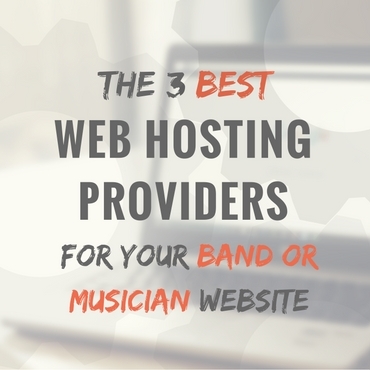 This section is also helpful to find out information about music gear. When you click on a piece of gear, it brings you to a page that gives specific information about the product, when it was made, the style, design elements, features, etc. This can be helpful in creating a description for your gear. At first arrival on the site, you can notice in the bottom right hand corner a small pop up box that allows for live chat. This box is always present when searching for and viewing gear (it is not present on the blog pages) to allow you to get help with any questions or concerns you may have. 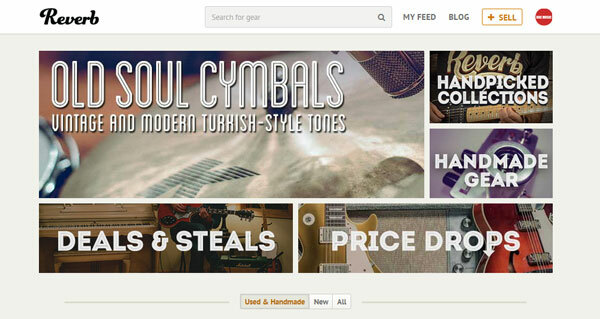 Reverb has categories that are dedicated to Price Drops and Deals & Steals. Price Drop featured products, as you might assume, are products that have decreased in price since first being listed. When you click on a product, you will see on the product page the percentage price drop the product has experienced. Deals & Steals feature products that are great deals or below what they could be priced at. 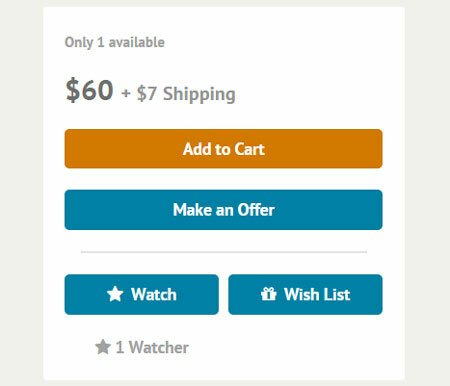 If you’re not satisfied with the price the product is listed at, you have the chance to make an offer (*if the seller has selected to show this option). It works just like negotiating a deal in person. You make an offer using the button on the product page. Once submitted, the seller has 24 hours to respond. They can accept or counter your offer. The whole process can go back and forth until a price is agreed upon. Reverb allows you to “bump” your listing which essentially makes it a featured listing. This is a paid feature which you can elect to use if you like. It’s usually a certain amount of money for a number of bumps. For example, $4 for 1000 bumps. 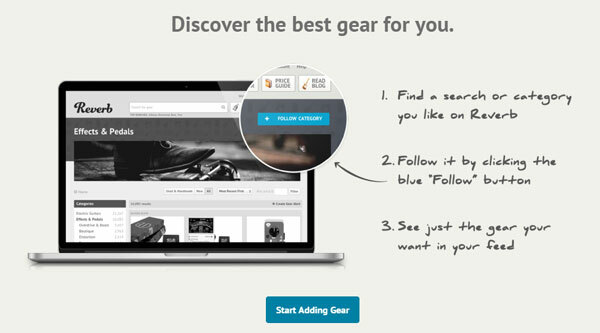 When a person searches for gear that matches your listing, it will be featured at the top of the search results. This counts as a “bump”. Bumps are also displayed on the Reverb Homepage, Brand Pages, Category Pages, and Handpicked Collections. You only pay after the item has sold and only for the number of bumps your item has received when it sold. So if your budget was $4 for 1000 bumps and you only received 100 bumps before your item sold, then you only have to pay 1/10 of the $4 which would be $0.40. 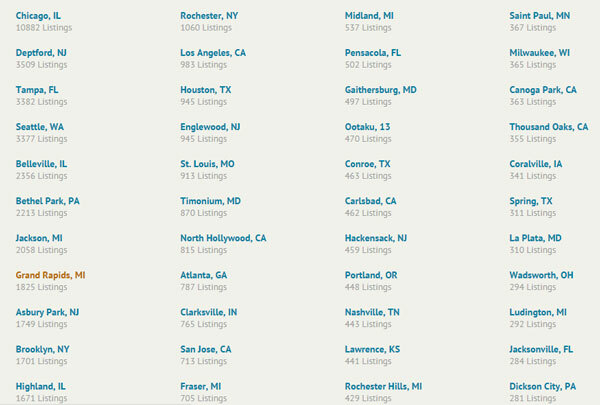 Additionally, Reverb staff will occasionally bump listings for free! They will bump listings that have high-quality pictures, good descriptions, are a great deal, and are unique or cool. 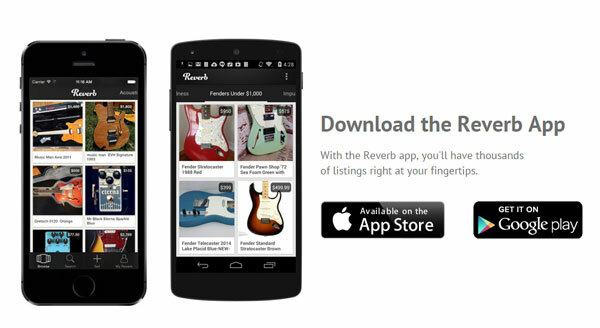 All listings on Reverb immediately become available on Google Shopping search results for free. Reverb has a section dedicated to handmade music gear. Handmade gear are items that are designed or created by the shop or person that sells them. 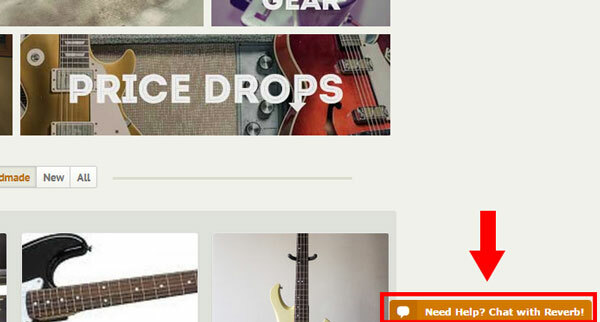 However, Reverb states that items one may be selling but did not make do not belong in this category. No having to deal with the hassle of renewing your listings like you have to do on Ebay. Products are listed on Reverb until they are sold. These include collections of gear that are hand picked by the Reverb Staff. 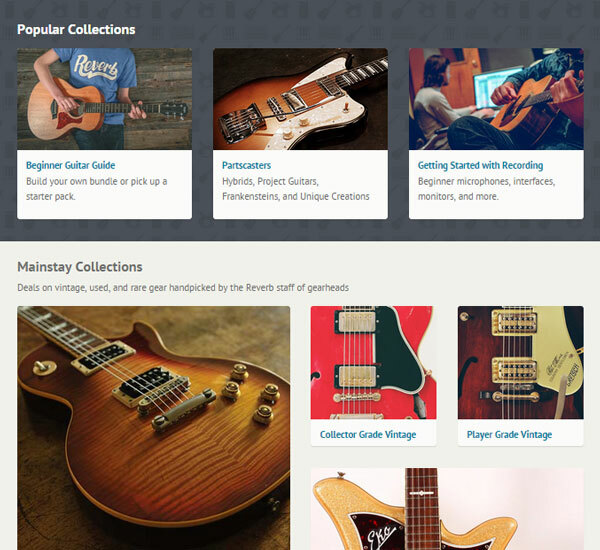 These collections include categories for Collector Vintage Gear, Player Vintage Gear, Gear of Famous Musicians or Bands, Handmade Gear, Beginner Collections, and Recording Solutions. The Reverb feed is your portal to viewing gear that you have your eye on. You can follow specific searches or product categories and these will appear on your feed. So if I’m looking for a birch drum set, I can follow that search and anytime something is added that matches that criteria, it will appear in my feed. You can even set up email alerts when new listings are made that match your search. You can manage and unfollow your searches and categories at any time. 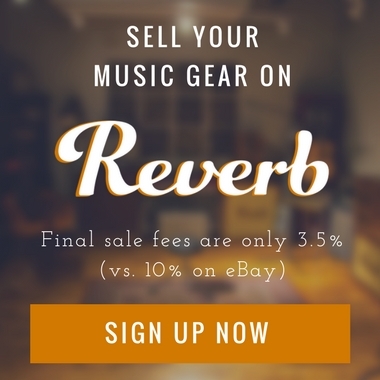 Reverb is dedicated to creating a safe place to buy and sell gear. That is why they put such a great focus on buyer and seller protection. They have staff that is dedicated to ensuring transactions go smoothly and will work with both parties in the event of a dispute. If you want to receive updates about future articles like this one as well as others regarding home recording, tips and techniques, advice, and more, sign up to the Infamous Musician Newsletter below to receive email notifications for future posts. Reverb has horrible customer service, and your lucky to get a refund in my experience. Buyer beware!!! eBay has reduced its “Final Value Fee” (the percentage of the final price you pay once it sells) for musical instruments and gear from 10% to 3.5%.